Distributed Feedback (DFB) Diode Lasers are fixed wavelength single mode diode lasers. Typical geometrical sizes of the laser chip are 1000µm x 500µm x 200µm (length x width x height). The laser chip is grown by MOVPE of compound semiconductor material. The optical gain is provided by double heterostructure which include several Quantum Wells for electronic confinement. 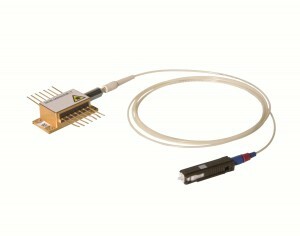 Distributed FeedBack (DFB) Diode Lasers are available at almost any wavelength between 760nm and 2800nm. Typical emitter width range between 3µm and 7µm. The single mode emission is enforced by a Bragg grating with the laser chip. The surfaces of the laser chip act as cavity mirrors due to the difference of the refractive index of the laser material and the surrounding air. The rear facet of the laser chip is provided with a high reflection coating. The front facet of the laser chip is provided with a high quality antireflection coating for avoiding the Fabry Perot modes of the laser chip.